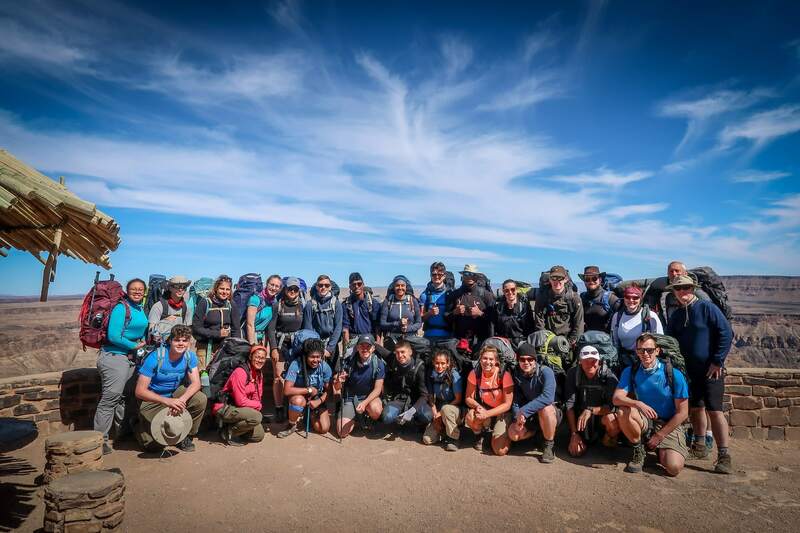 A year in the planning, preparation, training and fundraising; the London Wing ‘Cape Namibia’ Expedition of 25 cadets and staff departed for a two-week adventure in South Africa and Namibia in August 2018. 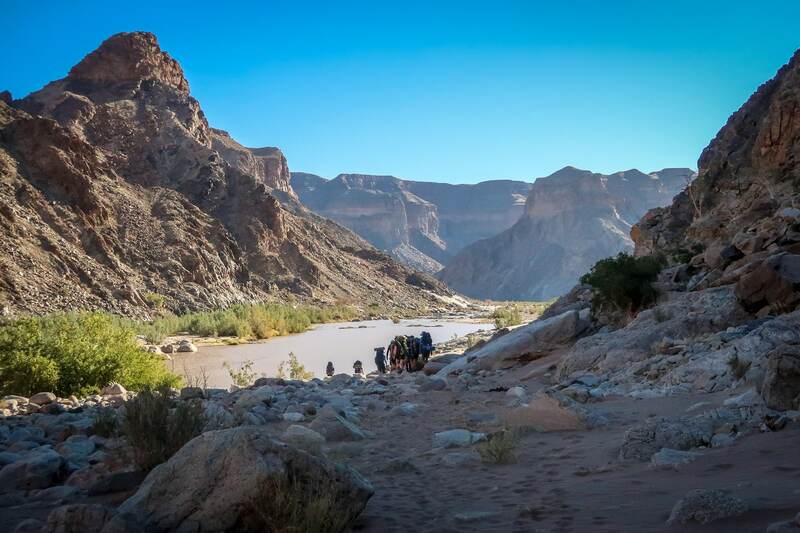 The prime goal of the expedition was to undertake the challenge of trekking the famous Fish River Canyon (second only to the Grand Canyon in size). 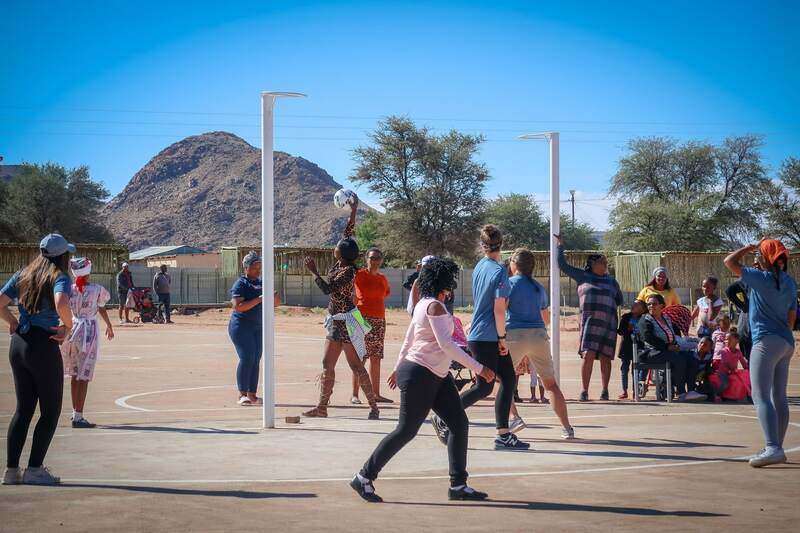 The secondary goal was to assist a marginalised community and help provide much needed sports equipment for their young men and women as well as engagement between young people of different communities. 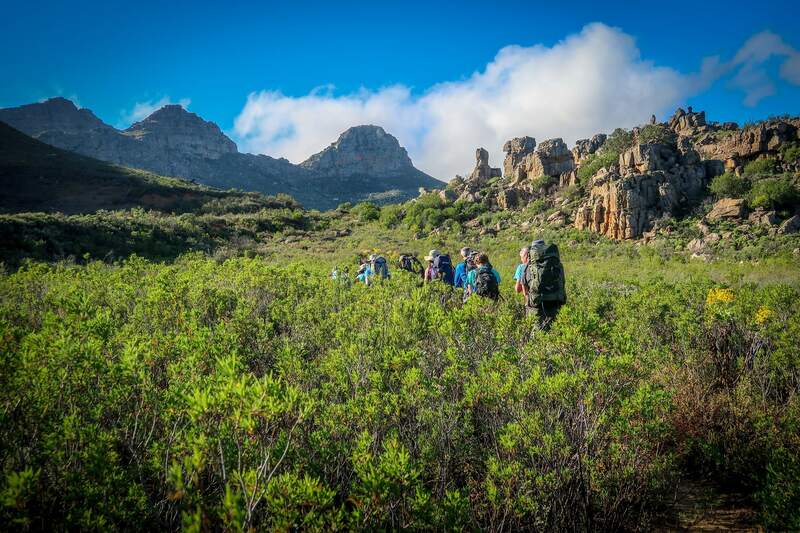 The 14-day expedition began in Cape Town with a journey to the Cederberg, a mountain range three hours north. 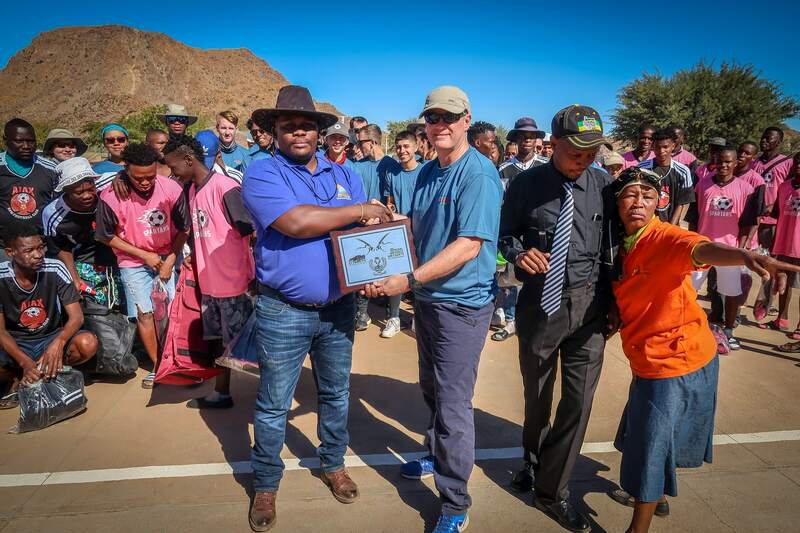 We spent two nights with a day’s walking to help acclimatise, stretch our legs and demonstrate to our in-country guides we were indeed prepared and ready for the Fish River challenge. 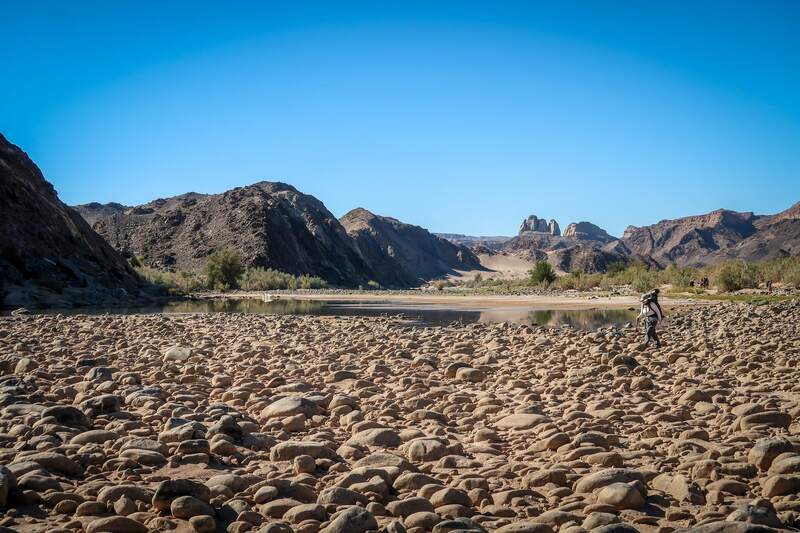 From the Cederberg we traveled further north to the Kalahari and set up camp for 3 days next to the Orange River. 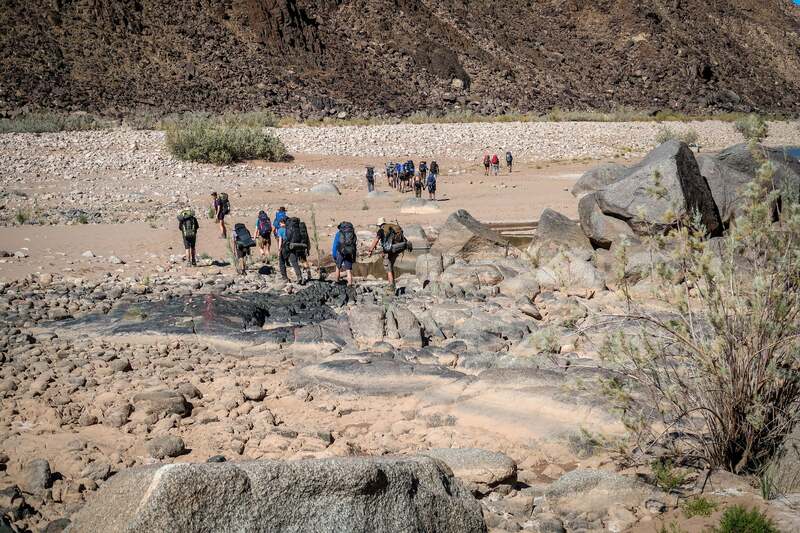 Here the team enjoyed some paddling and further acclimitisation walks with a focus on uneven terrain to prep for the canyon river bed. 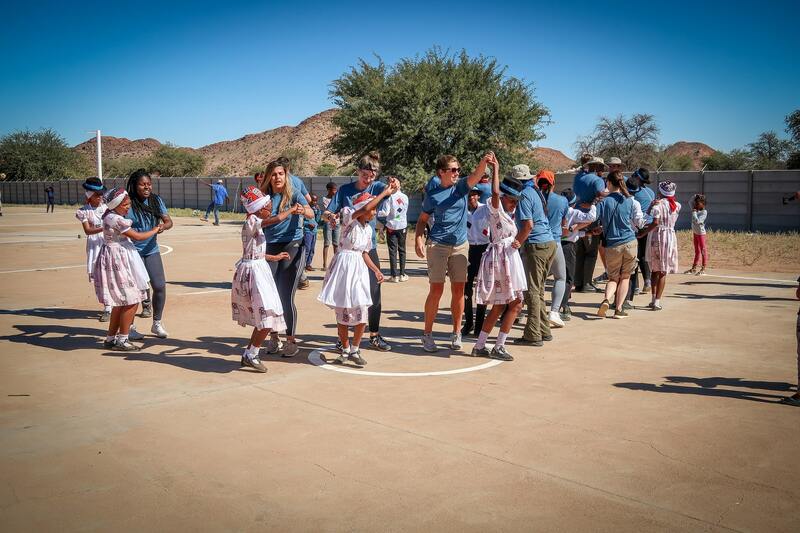 One of the expedition goals was to leave a lasting legacy and provide much needed equipment for one of the many communities within South Africa. Along with our in-country provider we identified the Riemsvasmaak. 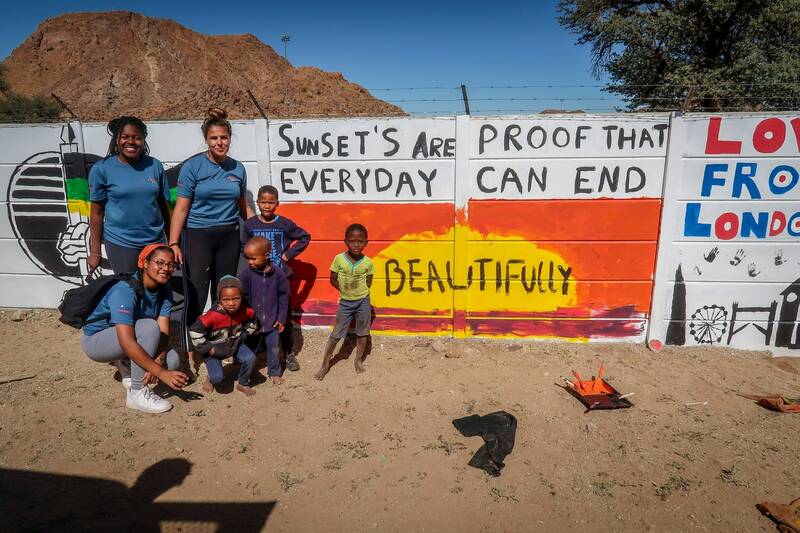 They are a marginalised community in the north of South Africa who are a still recovering from being displaced and treated incredibly poorly under Apartheid. 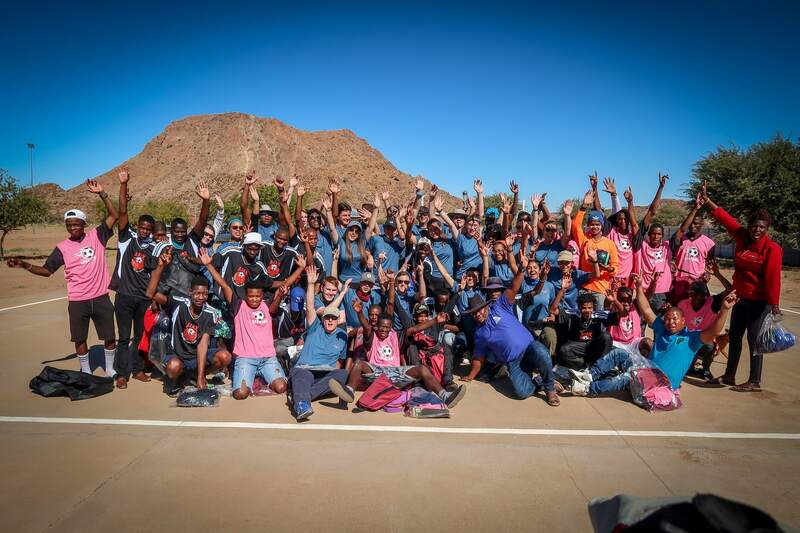 Our time with them was short, just one full day however we had prepared in the UK with additional fundraising to help with some of the identified needs of the community. 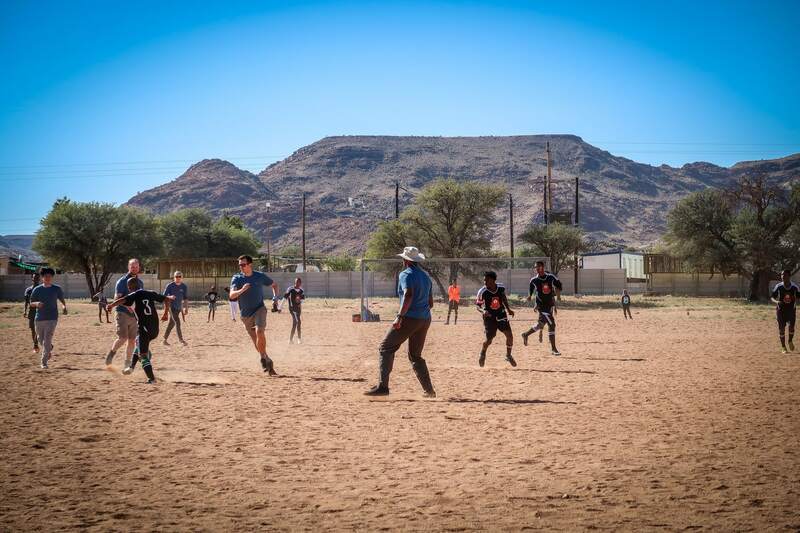 One of which was to help provide kit for their local football teams and a digital projector. 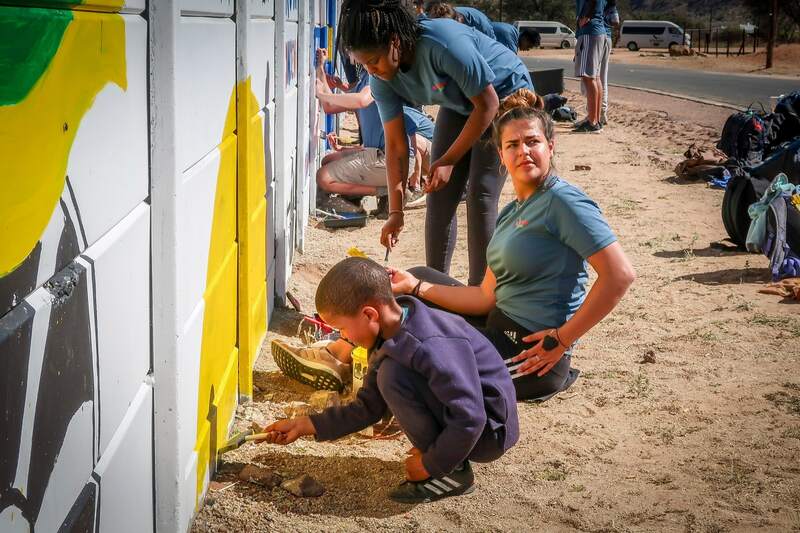 We also helped with each member of the team taking science books for their library as well as providing paint for refurbishment. 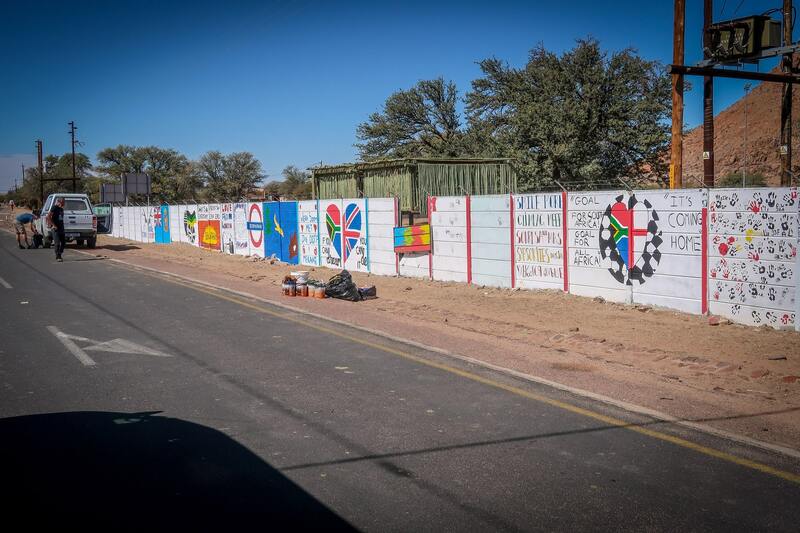 During the morning of our visit the team helped decorate walls to immortalise our contribution, in the afternoon we played football and netball as well as try our hand at the traditional dancing. 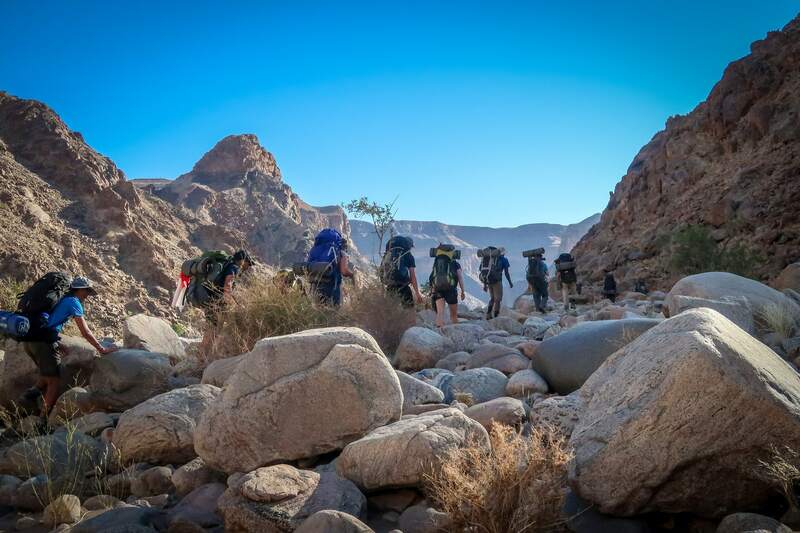 Then we moved into Namibia to reposition and prepare for our five-day descent and trek along the Fish River Canyon. 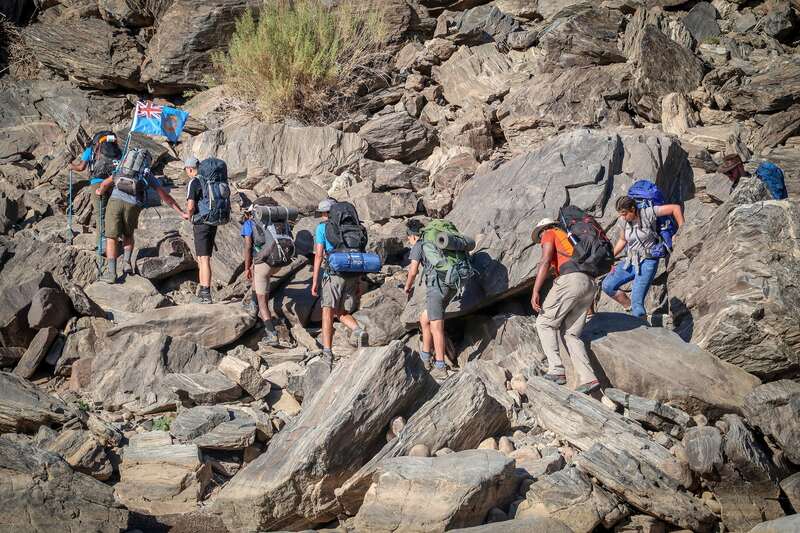 The Fish River Canyon trek presents its own challenges; apart from it being a hot and dry environment, it’s only open to hikers for several months of the year (it’s closed to hikers for the rest of the year due to the extreme heat. There is only one emergency exit at 20km along it’s 80km length. Therefore our preparation had to be comprehensive particularly with such a large group. If one member of the team had to exit it would impact on someone else’s experience. 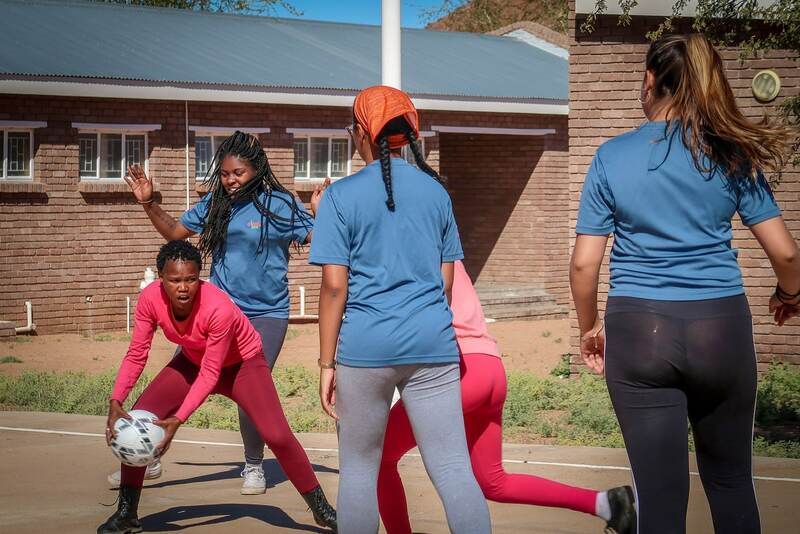 So in the UK we held fitness sessions focusing on fitness, strength and endurance. We held three training weekends. The first focused on team building and a skills shakedown. The second on hill walking and to practice on uneven terrain. 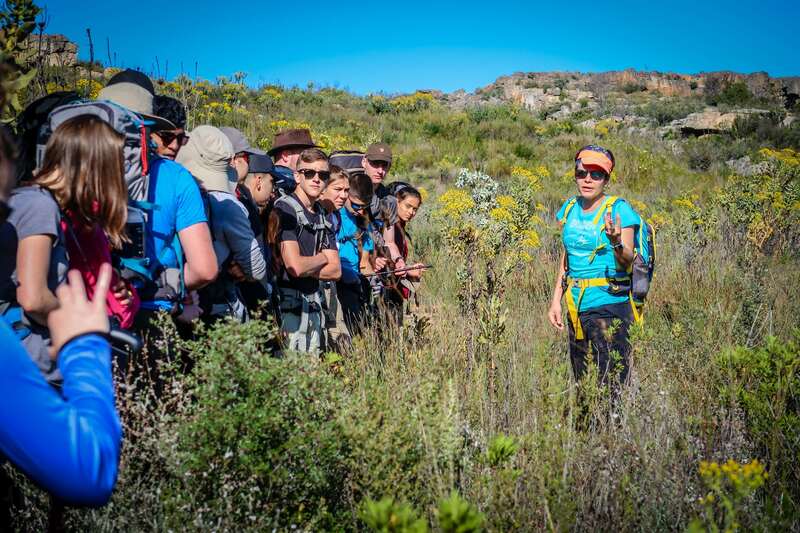 And the final weekend had a focus on endurance walking 50km over two days with kit. 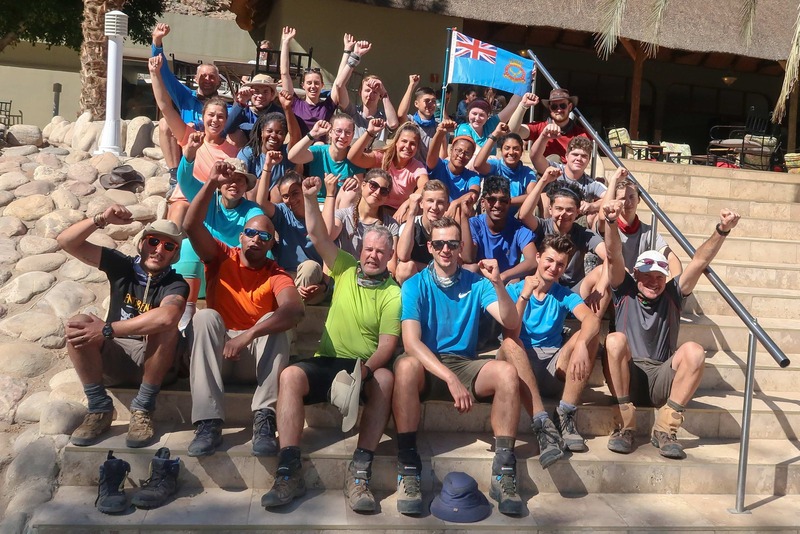 This gave all confidence that we were physically and mentally ready for the challenge and the hope we could minimise the risk of anyone’s premature exit. The trek itself was incredible. 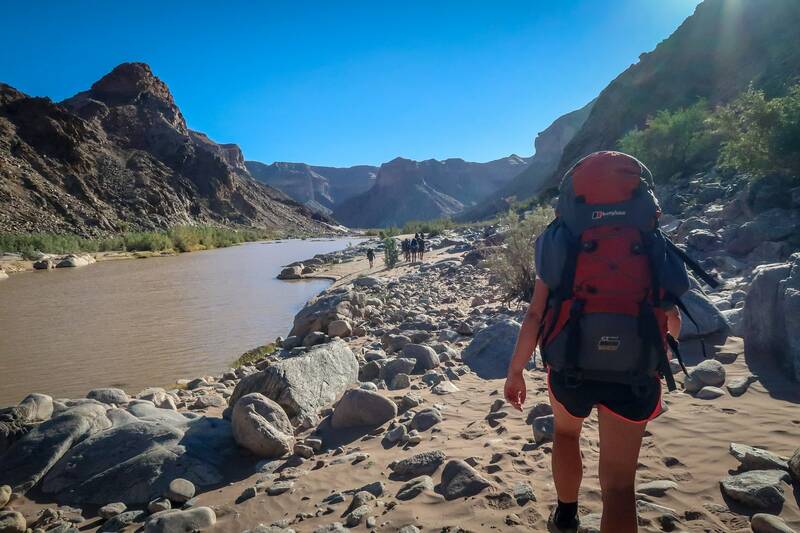 There were gasps and various ‘comments’ as the team stood on the rim of the Canyon for the first time to take in the shear scale of the Canyon, it is simply epic in proportions. Within the hour we had started the descent and by mid afternoon we had reached the base of the Canyon and were at the start of the trail. 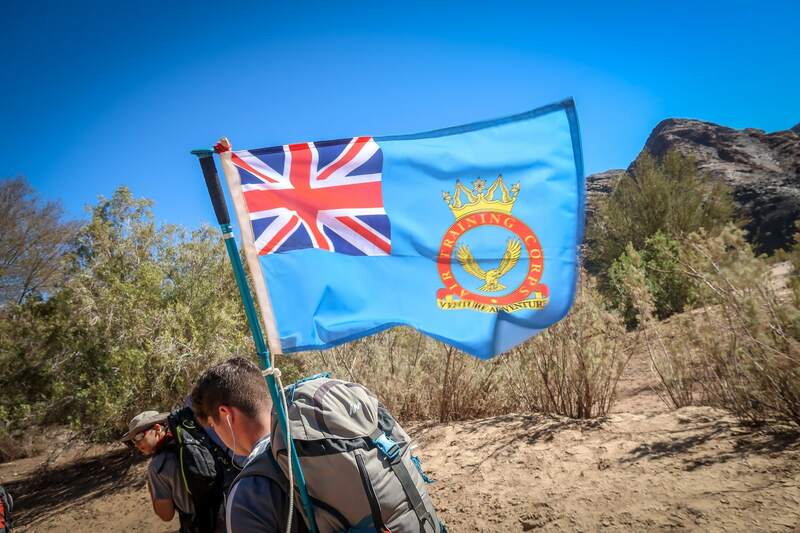 Whilst our preparation stood us in good stead physically, nothing we did in the UK can prepare you for the challenge of the terrain. 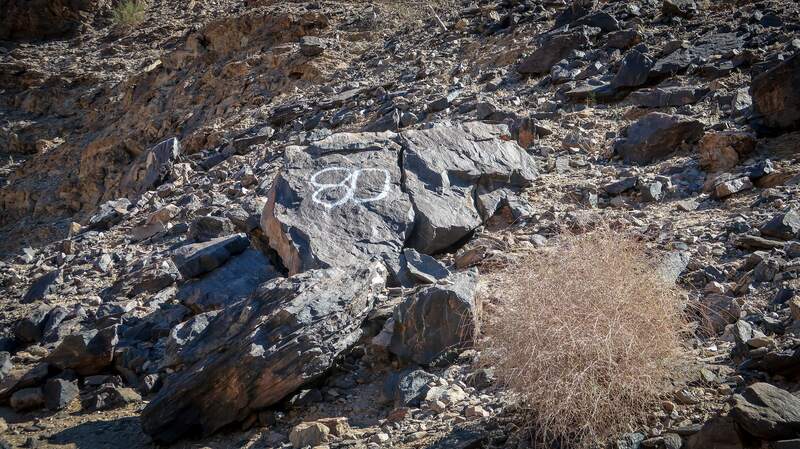 On paper the proposition seems fairly straightforward; trekking 80km alongside a flat riverbed, how hard can that be? No one should underestimate how challenging it actually is. 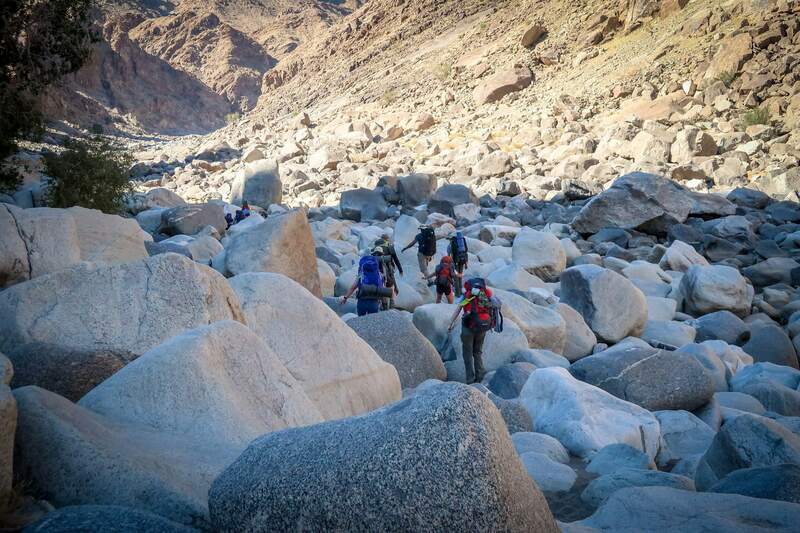 You are either walking on energy sapping sand, hopping across seemingly endless car-sized boulders or along the rocks of the river bed itself. It’s hot too! However we were lucky that it wasn’t as hot as it usually is for the time of the year, around 25 degrees during the day and around 12 during the evenings. It’s fair to say that waterproofs are not required. 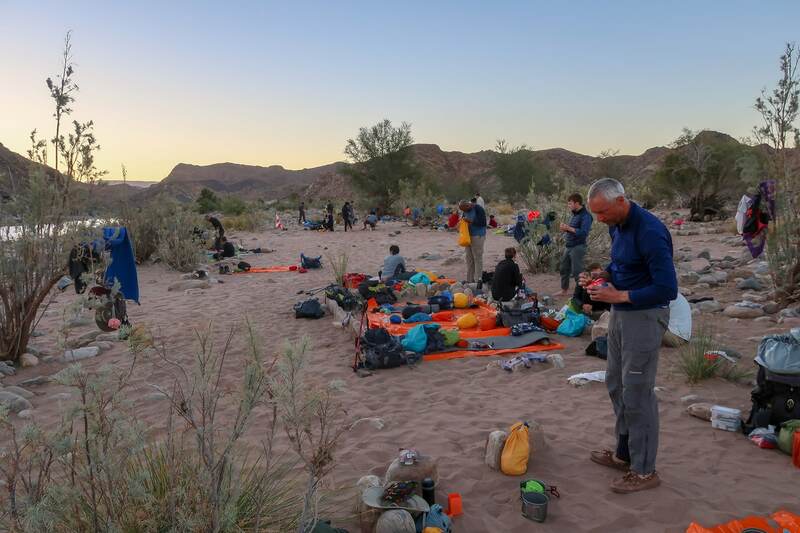 In fact another challenge was the mindset of what a kit-list might consist of in the UK is quite different to that required for the Fish River Canyon. No waterproofs and no tent – just a ground sheet to sleep on and one change of clothes. We did have the benefit of being able to wash our clothes in the river; by the morning our clothes were dry. One of the particular irritations could be the sand, it gets everywhere and the one place you don’t need it is in your boots. 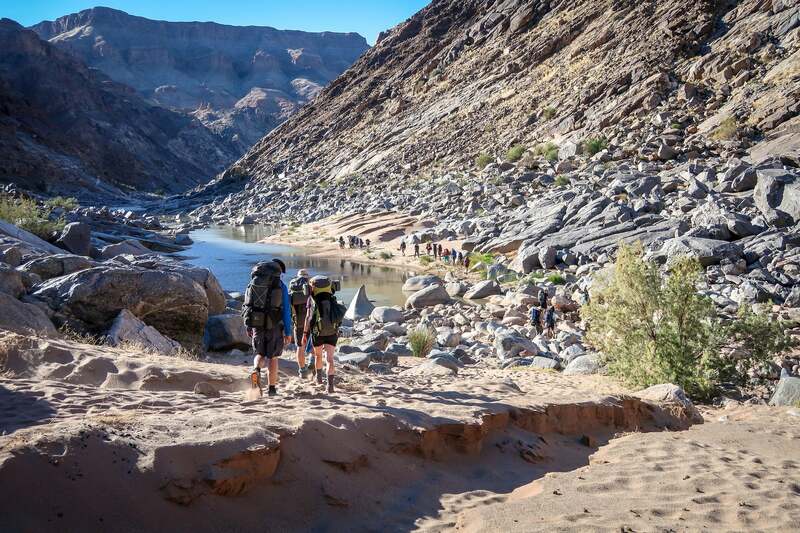 Most of the team did heed advice and purchased sand gaiters, an essential piece of kit for the Fish River Canyon as sand in boots can lead to additional friction and that means blisters. The physical demands of walking around 20km each day with weight and in heat presented its own personal challenges. Hydration was critical and having the river close to hand was essential. 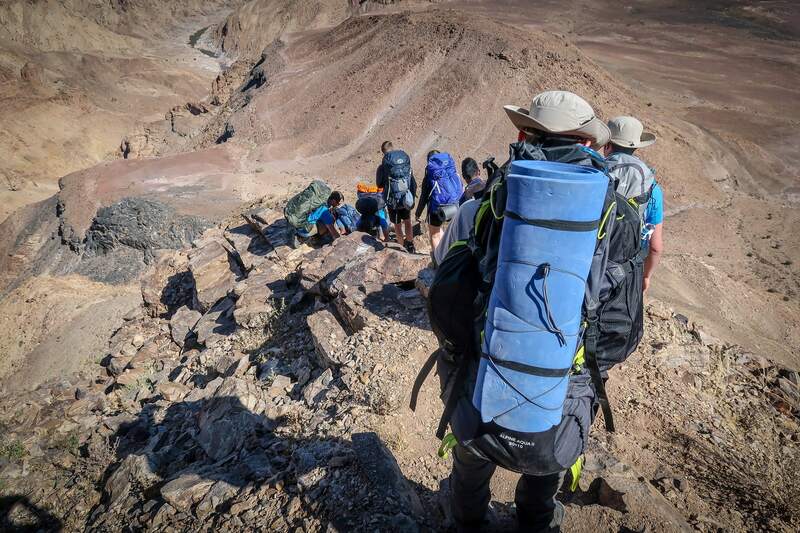 Some of the team suffered to different degrees, with blisters or sore knees. Fortunately we had prepared by sending two of the staff team on a Far From Home expedition first-aid course to enhance knowledge far beyond what is required for the UK. Furthermore our group first-aid kit was packed with additional pain relief and supplies. The Canyon itself is simply epic. The Canyon walls rise to either side of you with the scale that is simply awe inspiring as the scenery morphed before you. We heard jackal, but fortunately did not see any and observed leopard tracks. We even had a visit from a troop of baboons. Otherwise the insects kept us on our toes with huge crickets. 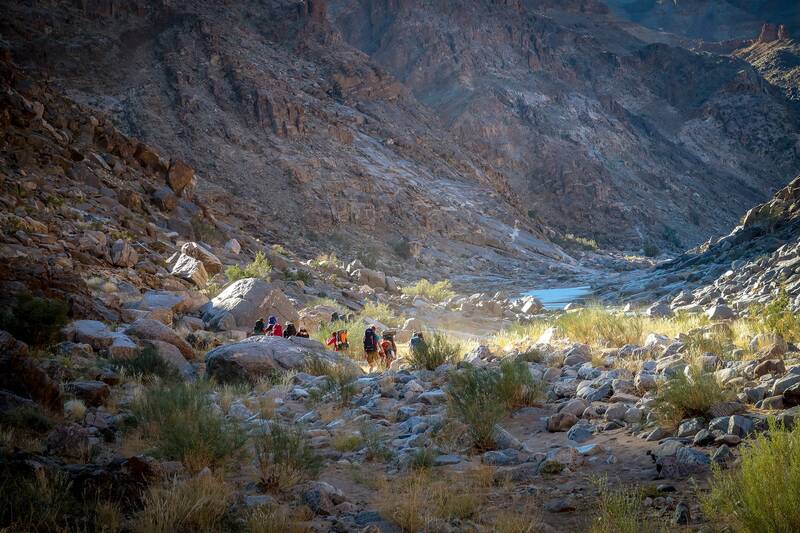 We exited the Canyon early afternoon on the fifth day with all the team in high spirits to complete the trek. The exit of the trek leads you to the Ai Ais Resort where the team enjoyed hot showers, cold drinks and burgers to relax until the next day. 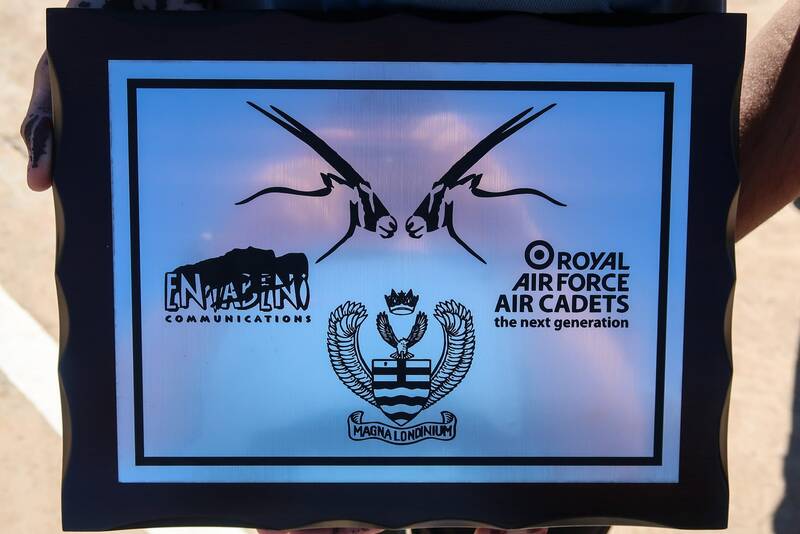 Cpl Matthew Raj – 241 Wanstead & Woodford Sqn. From Ai Ais we started the long road trip back to Cape Town back along the same epic vistas. That evening we arrived back in Cape Town and spent the next day taking in some tourist attractions such as Table Mountain, the waterfront and down to Simon’s Town to visit the penguins. We then departed to the UK. The expedition aims where multi fold. Rather than one clear aim we delivered an expedition not only to Cadets who may otherwise have struggled with the financial commitment to experience a once on a lifetime opportunity; but also Cadets not necessarily physically gifted and in doing so instilled a deep impact on our Cadets that anything is possible, appreciate life and don’t take what you have for granted. 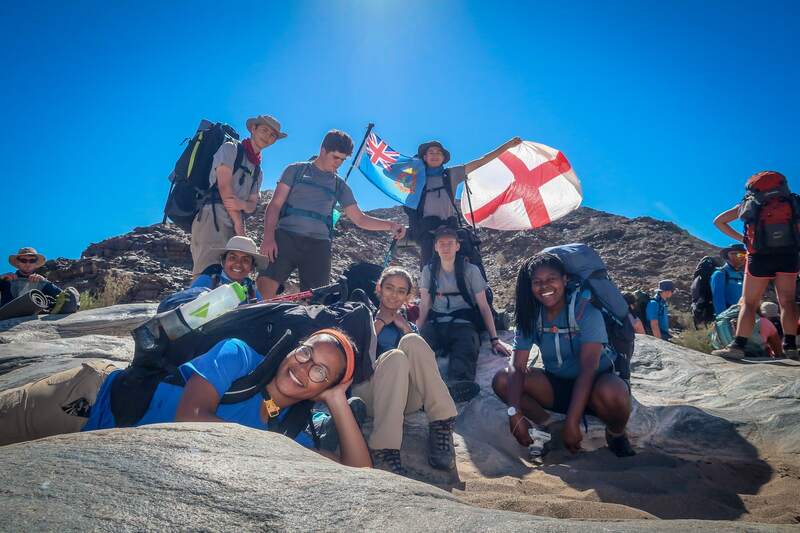 We are grateful to our supporters who provided funding which enabled our expedition: The Ulysses Trust, The Singleton Trust, Jack Petchey Foundation, London Wing RAFAC, The GET Exploring Trust, RAF 100, RAF Charitable Trust, GL RFCA and Headquarters Air Cadets. We thank you. 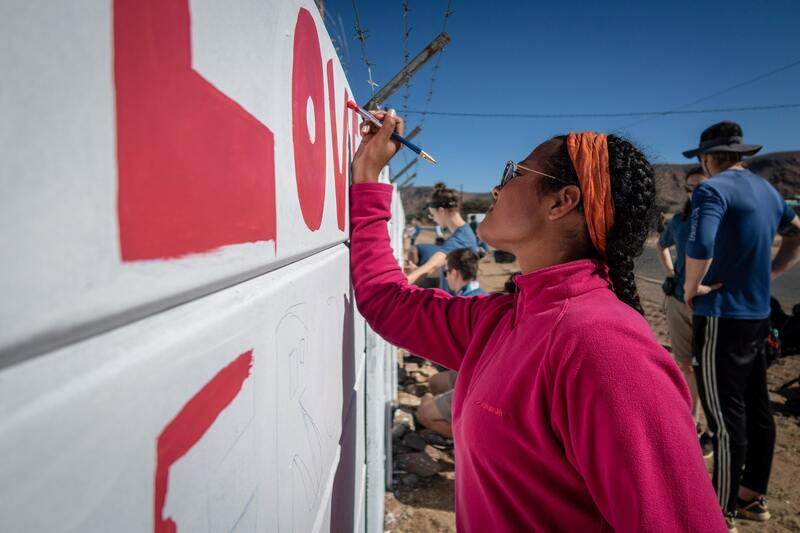 “We traveled to a new continent from the warmth of our homes. Even though dreading the 90km trek that was dawning upon us. 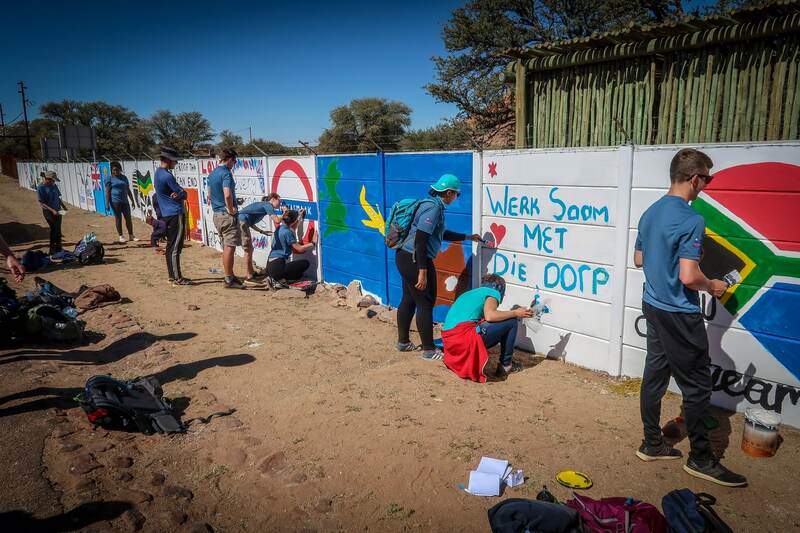 We had the most wonderful day meeting the Riemvasmaak community, painting and brightening up their athletics field and providing their football teams with new kits. They showed us their smiles and happiness and it was eye opening to see how our help had made such a big impact on them. 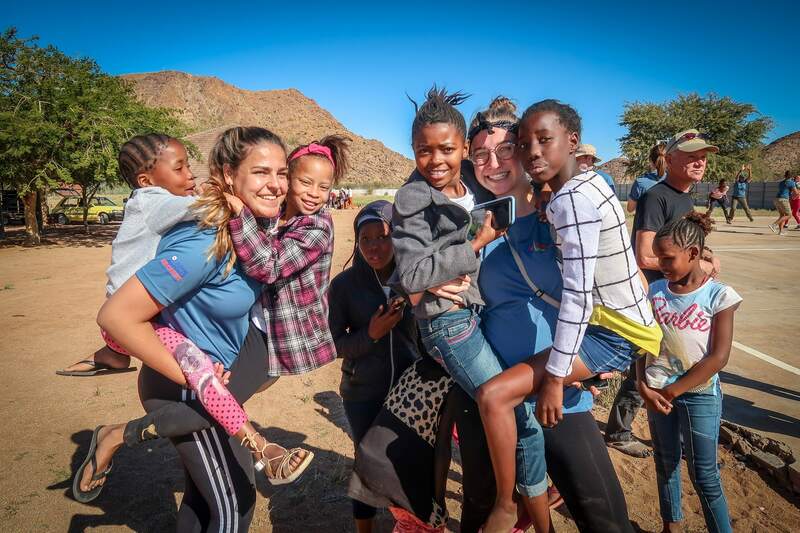 “We enjoyed two-day walks and a day of paddling along the Orange river which is something I never thought i would be able to do in my life. 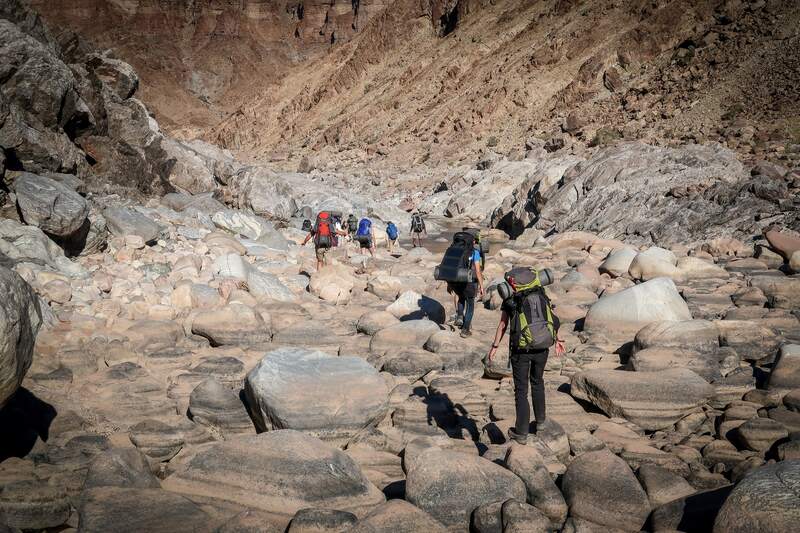 “The canyon was a hard struggle but we powered through as a team and conquered the great Fish River Canyon. 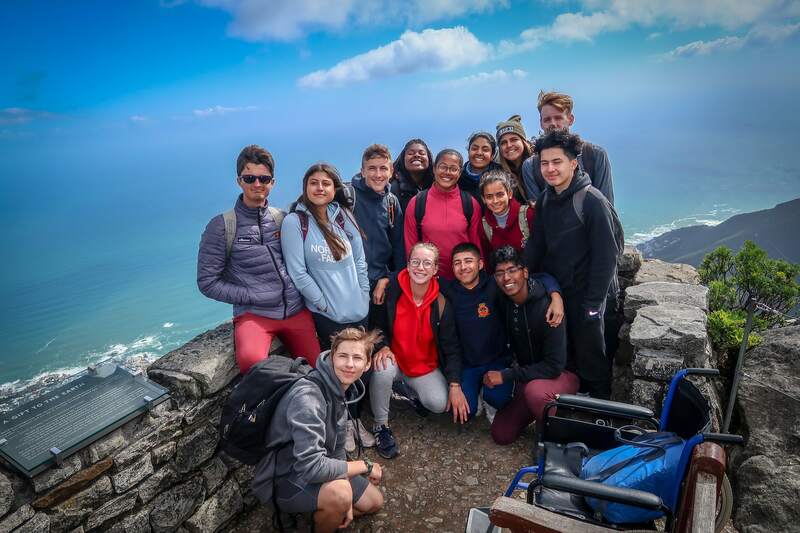 There were hardships but we built our friendships and teamwork skills to help each other and made sure everyone made it to the lovely spa at the end which solidified the whole trek. 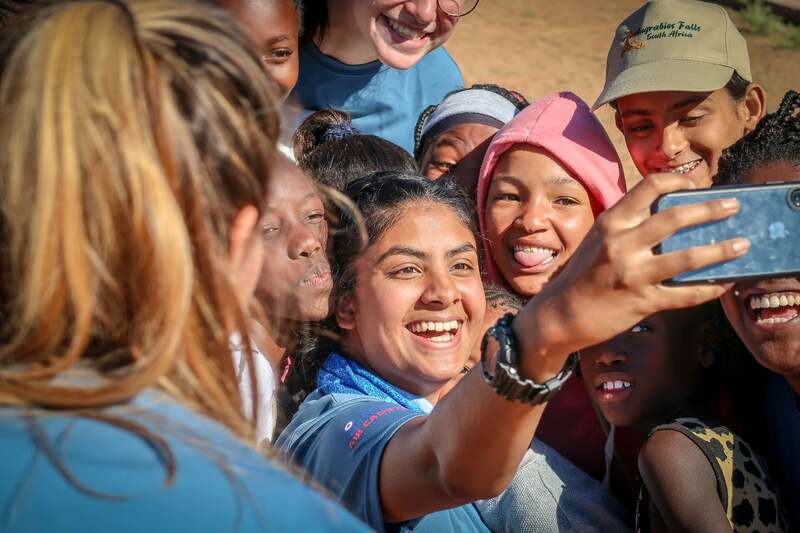 “I have thoroughly enjoyed and openly embraced the wonderful opportunity given to us by RAFAC London Wing. 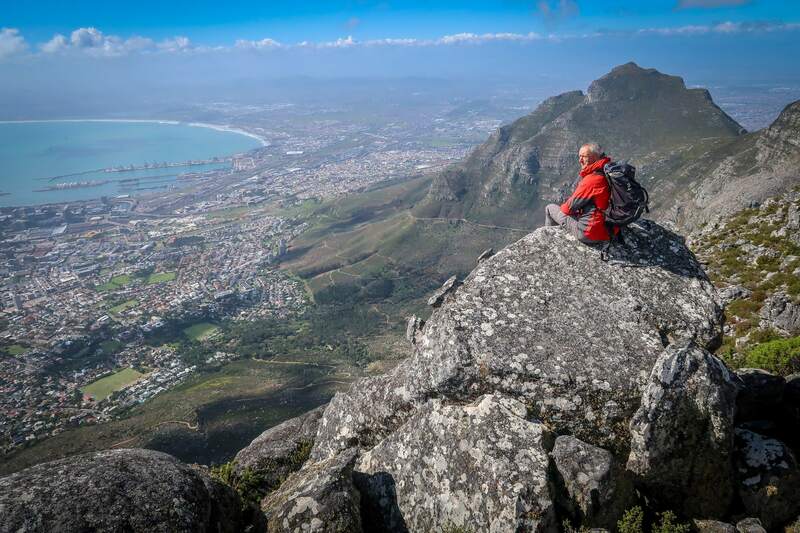 Each and every member of the team can take away so much; personally for myself just the opportunity to embark to the other side of the world is phenomenal. 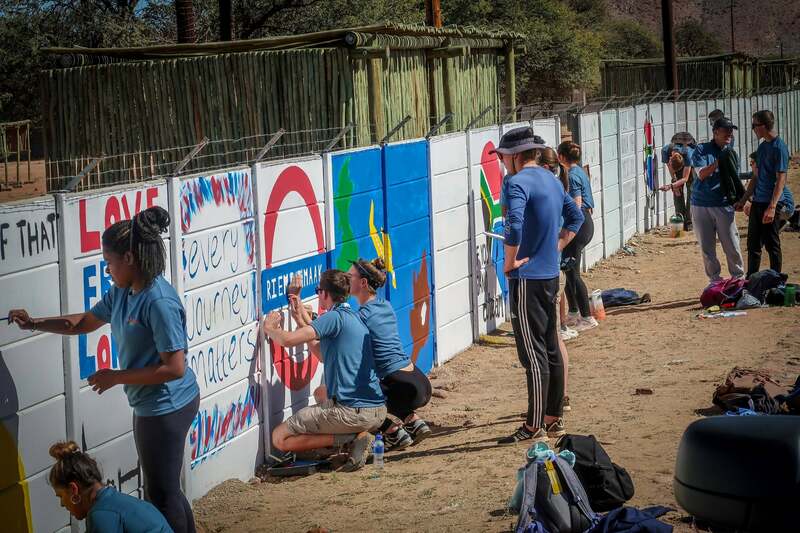 “I felt like as a team we contributed huge amounts to the Rimvesmark community however, we took much more than anticipated. Being grateful for all we have, where we live and what circumstances we are in. These people being so happy and prosperous despite their vivid yet turbulent history showed the cadets and staff alike to be just that, grateful, happy and understanding.